So many ladies prefer to transition rather than chopping off their permed hair in order to start a healthy hair journey. I transitioned for 12months, I set a goal to go all the way to one year before I trim, and I did achieve that. Transistioning could be frustrating especially if you did not do your home work before embarking on it. Dealing with two different textures could be tasking. So if you discover its getting you worked up simply trim off the strands and continue braiding and fixing as you wish. Before you become a product junkie, use up your old products first. Refraining from becoming a product junkie will force you to focus on your hair regimen –which is most important. As you use up your old products, try to use new ones one at a time. Do not pile up your cabinet with products you hear about and use all at once. This way you can tell what is working for you and what is not. This is simply where your relaxed ends meet the natural hair. 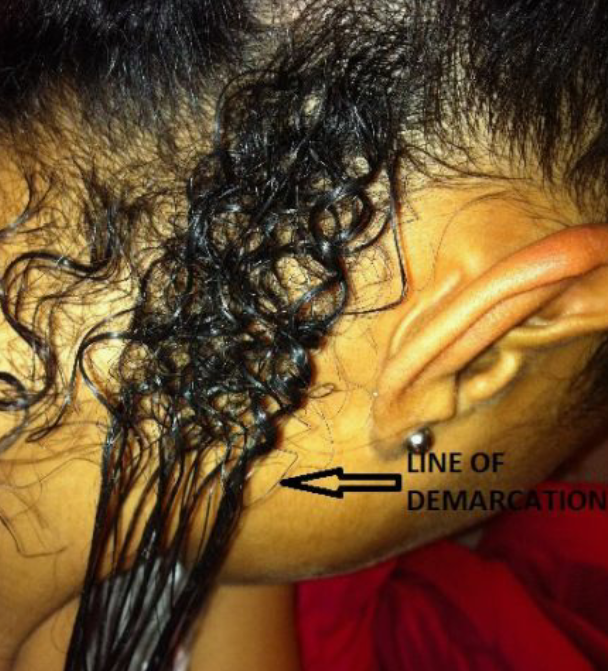 This is the weak point so take extra care to reduce breakage because chances are that this is where breakage will occur. Try to avoid heat styling options and over manipulation. Try twist out styles and use perm rods at the tips as this will help give the two textures an identical look. It sure is tempting but you cannot see your true pattern until all relaxed ends get cut off. It is in big letters to emphasize the importance. lol. Contrary to popular belief it is actually a good thing to deep condition with heat so do not be afraid to try a little hooded dryer sometimes. You could also get conditioners that say deep conditioner on the jars/bottles to properly nourish your strands. African Best hair mayonnaise is a good product to use and Shea Moisture has some deep conditioning Treatments. Practice makes perfect right? So why not try getting good at two strands twist out, flat twists out, Bantu knot out and corn rows? Be sure to use perm rods/rollers at the tips so the textures are blended. The key to healthy hair is a clean scalp. Your scalp creates natural hair sebum so do not be tempted to lather on grease. Instead opt for lighter oils like jojoba oil or Castor oil to massage scalp but always avoid Mineral oil. Keep hair and scalp clean whenever you see build up. Contrary to popular belief (again) trimming regularly will not give you a faster growth but it will reduce breakage especially during the Transition. Trim off split ends regularly as you will have them. Besides you will be cutting the relaxed ends off anyways right? This is especially important. Do not over manipulate your hair. Make good use of protective styles so long as they are not too tight or kept in too long. Your hair is very fragile at this stage so protection is key. Deep condition and practice retention. Sometimes it may seem like your hair is not growing and it can be frustrating dealing with different textures. At this point you may be very tempted to whip out your jar of relaxer since it is what you are familiar with and it´s ok to feel that way. However if you are dedicated to keeping your natural hair then a lot of patience is required. Your hair grows an average of 1/2 Inch a month just like everyone else. So try to remember that and protective styles help a lot as it stops you from obsessing over length every minute. Before you know what´s happening, you have a head full of amazing curls. To get satisfactory results, it´s ideal to learn the different ways of dealing with your hair in Transition mode and it´s imperative that you do not expect your natural hair to act like relaxed hair. Once you have finally accepted the growth pattern and nature of your curls, then you will be more understanding of dealing with it carefully. Try to recreate styles that enhance and highlight your new texture together with the relaxed hair that you are growing out. Are you transitioning? If yes, how is it going? Thank you and welcome on board. Today, while I was at work, my sister stole my iPad and tested to see if it can survive a 30 foot drop, just so she can be a youtube sensation. Hello dear, you can go ahead and share it with your group. health's hazards comprise in spending too much time in front of the computer. By beginning with little money, it is possible to make certain you don't lose much. become received by web-site signing up. Thanks much, you can check the categories and pick what interest you. I do believe all the concepts you've introduced in your post. Analysis Opinions control and assist in online surveys. customize it your self? Anyway stay up the nice high quality writing, it's uncommon to look a nice blog like this one today. I have been looking for tips like this to help me transition. Seriously considering it so thanks for these helpful tips!